Cardinal DiNardo was elected to chair the Committee on Divine Worship, but his election as Vice-President of the USCCB prevented him from assuming leadership of the committee. 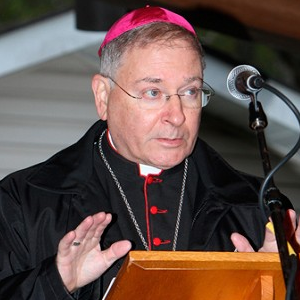 Therefore, the bishops elected Bishop Arthur J. Serratelli of Paterson, New Jersey, to chair the committee beginning 14 November 2013. Bishop Serratelli previously chaired the committee from 2007-2010. Bishop Arthur Joseph Serratelli was born in Newark, New Jersey on April 18, 1944, the son of Eva Fasolino and the late Pio Serratelli. He attended Ann Street School in Newark and completed his grammar school education at Our Lady of Mt. Carmel Parish, Newark. He then attended Seton Hall Preparatory School and Seton Hall University in South Orange. He studied for two years at Immaculate Conception Seminary, Darlington, and then at the North American College in Rome. While in Rome, he did his theological studies at the Pontifical Gregorian University and Scripture studies at the Pontifical Biblical Institute. He received a Bachelor of Arts Degree from Seton Hall University in 1965, a Licentiate in Sacred Theology from the Gregorian University in 1969, a Licentiate in Sacred Scripture from the Biblical Institute in 1976, and a doctorate in Sacred Theology from the Gregorian University in 1977. Ordained to the priesthood in 1968, Bishop Serratelli served for one year as parochial vicar at St. Anthony Parish, Belleville. He taught Systematic Theology at Immaculate Conception Seminary for two years and then returned to Rome for higher studies. From 1977 until 2002, he taught Sacred Scripture and biblical languages at the seminary. He was Rector of St. Andrew’s College Seminary at Seton Hall University from 1997-2000. He also taught at the Redemptorist Seminary in Esopus, New York; St. Joseph’s Seminary, Dunwoodie, New York; the Institute of Religious Studies, Archdiocese of New York; and the lay ministry program of the Educational Program Service of Trinity College, Washington. Bishop Serratelli has been active in giving retreats to priests and religious, diocesan convocations and lectures throughout the United States. He had also been a weekend assistant in Most Blessed Sacrament Parish, Franklin Lakes, and served in Holy Family Parish, Nutley and Saint Anthony Parish, Passaic. His Holiness, Pope John Paul II named him a Prelate of Honor in 1998. His appointment as Titular Bishop of Enera and Auxiliary Bishop of Newark was announced on July 3, 2000. His Episcopal Ordination was celebrated on September 8, 2000. He was appointed Vicar for Ministries, Regional Bishop for Essex County, and Vicar for the Apostolates and Education shortly thereafter. In March 2002, he was appointed Vicar General and Moderator of the Curia for the Archdiocese of Newark. He was installed as Paterson’s seventh bishop on July 6, 2004 at the Cathedral of Saint John the Baptist, Paterson. As a member of the USCCB in Washington, Bishop Serratelli serves as chairman of the Committee on Divine Worship and member of the Ad hoc Sub-Committee for the Review of Scripture Translations. He is also the chairman of the International Committee on English in the Liturgy (ICEL) and member of the Vox Clara Commission. Bishop Serratelli also serves on the Task Force for the Review of the Lectionary, Ad hoc Committee for the Review of the Catechism and the Ad hoc Committee for the Spanish Bible for the Church in America.